In this video, you can discover the latest feedback from Lucas Garcia, Digital Communications Officer at The Adecco Group France. 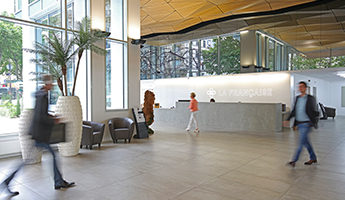 The Group, which happens to be a leader in human resource solutions, has 9,000 permanent employees in France and 9 expert brands with their respective websites and social networks. To make the online content of the Group and of its brands accessible to employees, and to enable their amplification on social networks, The Adecco Group France set up an Employee Advocacy and Employee Engagement program with Sociabble in 2015. With an innovative strategy of engaging their ambassadors, Nicolas Sutter (Digital Communication and Engagement Manager) and Lucas Garcia organized the first edition of the Sociabble Champions Day in June, 2018. This day, exclusively reserved for the 50 best ambassadors of 2017, was an opportunity to thank them and give them the keys necessary to accomplish even more on their social networks. This is the case study that was presented following the initial launch of its successful employee advocacy program with Sociabble. Having set in motion an ambitious digital transformation plan, the Adecco France group chose to implement the Sociabble employee advocacy and employee engagement platform. The Sociabble interface is made up of 14 channels that aggregate external communication feeds: one channel for each of the Adecco France brands, plus others that are organized according to key themes that tie in with the group’s activity, as well as digital trends. Users can subscribe to their channels of choice, and share posts on their own social media accounts at the click of a button. Thanks to Sociabble, Adecco France Group employees have easy access to the content published on all 45 social media accounts of the group and its brands. In this way, Sociabble makes it easy for the Adecco France group to empower employees as brand advocates, and to generate additional visibility for the rich content being published on a daily basis. The Adecco France Group also uses Sociabble to help employees develop their personal branding on social media, by engaging in social selling and using pertinent content to engage clients and potential job candidates. This is made possible by market watch channels, which aggregate content that is submitted and shared by employees themselves. As Sociabble is available natively for Android, iOS and Windows Phone, employees can access the platform wherever they are, on any device. Indeed, mobile is Adecco France Group employees’ preferred method of use. 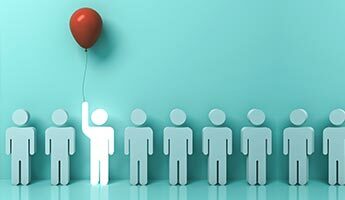 The deployment of a company-wide employee advocacy and engagement program requires a strategic launch plan, and the Adecco France group chose to roll out its initiative in stages. The group did not start from zero; a number of employees were already active sharers of company content on social media. These individuals were introduced to the Sociabble platform first, along with marketing and communication teams. The two groups were to become the program’s “super ambassadors”. The next crucial step was to onboard top management, which was achieved when Sociabble was introduced at the Adecco France group’s managerial convention. And finally, Christophe Catoir, President of the Adecco France group, presented Sociabble during his quarterly web conference with all employees. “Having the support of top management is essential to engaging employees in an advocacy program,” notes Sophie Ak Gazeau, Digital Director of the Adecco France Group. 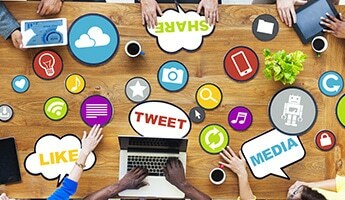 User Adoption and Engagement: What’s in it for Me? 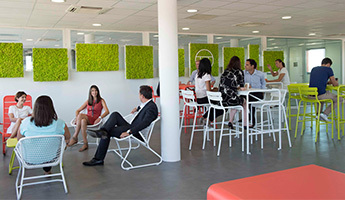 When introducing Sociabble to employees, the Adecco France group focuses on the fun, simple and practical nature of the platform. The group organizes 30-minute webinars for new users, during which project leaders highlight the benefits of the tool and demonstrate how sharing pertinent content on social media has a positive impact on personal branding, and puts individuals in a better position to engage prospects, clients and job candidates. In early 2016 the Adecco brand launched a new identity, giving the group the perfect opportunity to coordinate the launch of Sociabble with the re-branding of its flagship trademark. Content relating to the “new” Adecco was highlighted on the platform, and users awarded additional points for sharing these posts. Together with dedicated newsletters sent out by platform administrators, this gamification campaign helped the Adecco France group to generate a social media reach of over six million end users. If you’d like to download more information on The Adecco Group initiative and its successful employee advocacy program, you can download the full case study.